White Lanterns: Wesak 2011 by Thiyagaraja Arasanayagam is the winner of the Gratiaen Prize 2015, for the best work of creative writing in English by a Sri Lankan writer living in Sri Lanka. 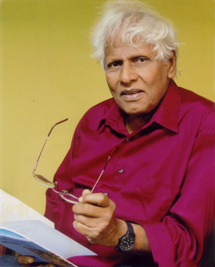 Thiyagaraja Arasanaygam is a past winner of the State Literary Award for the best original play script in English for his play “The Intruder”. He has also previously been shortlisted for the Gratiaen for his poetry collection “The Singing of the Angels”. Arasanayagam is currently based in Kandy and belongs to a family of writers and artists. The Gratiaen Prize was founded in 1993 by the Sri Lankan-born writer Michael Ondaatje after he won the Booker Prize for The English Patient. The Prize is awarded each year to the best submitted creative work in English, written by a Sri Lankan writer resident in Sri Lanka. Both published works and unpublished manuscripts are accepted as submissions. The judging panel for the Gratiaen Prize 2015 was made up of: Captain Elmo Jayawardena, retired airline captain, humanitarain and writer (chair); Tracy Holsinger, theatre practitioner and Dr Dinali Devendra, an academic at the Open University of Sri Lanka. The judging panel commended the creativity and innovation of the work submitted for consideration this year and explained the multiple challenges faces when judging across different genres of literature. They also stressed that writers need to subject their work to a rigorous editorial process and to opt for publishing through a professional publisher than self publish as that would raise the quality of the final product. Democracy: Does It Have Any Meaning For The Tamils?